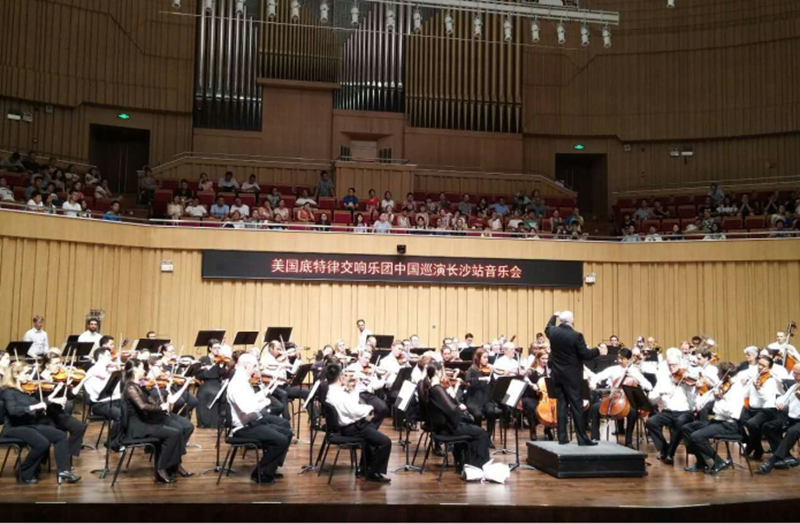 On July 25, Detroit Symphony Orchestra (DSO) visited Changsha in Hunan province and presented a concert in Changsha Concert Hall. Consul General Hong Lei attended this concert, which was one of the 5 concerts of DSO's China Asia Tour. Mr. Wu Yibiao, Deputy Director General of the Foreign Affairs and Overseas Chinese Affairs Office of Hunan province, Mr. Lu Xingying, Deputy Secretary General of Changsha Municipal Government, Mr. Yang Changjiang, Director General of Changsha Municipal Administration of Culture, Radio, Film & TV, and Mr. Zheng Lihu, Director General of the Foreign Affairs and Overseas Chinese Affairs Office of Changsha Municipal Government also attended this event. DSO Music Director Leonard Slatkin conducted the concert. The repertoire included Overture to Candide by Leonard Bernstein, The Dream of the Red Chamber Capriccio for Cello and Orchestra(score by Wang Liping and re-arrangement by Alfred Wong & Trey Lee), and Symphony No. 4 in F Minor, Op. 36 by Pyotr Ilyich Tchaikovsky. The concert was warmly received by nearly one thousand music fans and audiences. 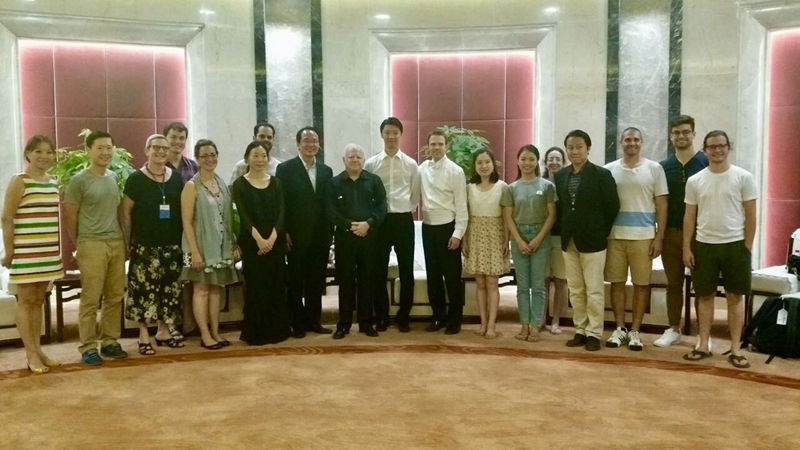 After the concert, Consul General Hong Lei met with DSO President and CEO, Anne Parsons, Music Director Leonard Slatkin, and some artists of DSO. 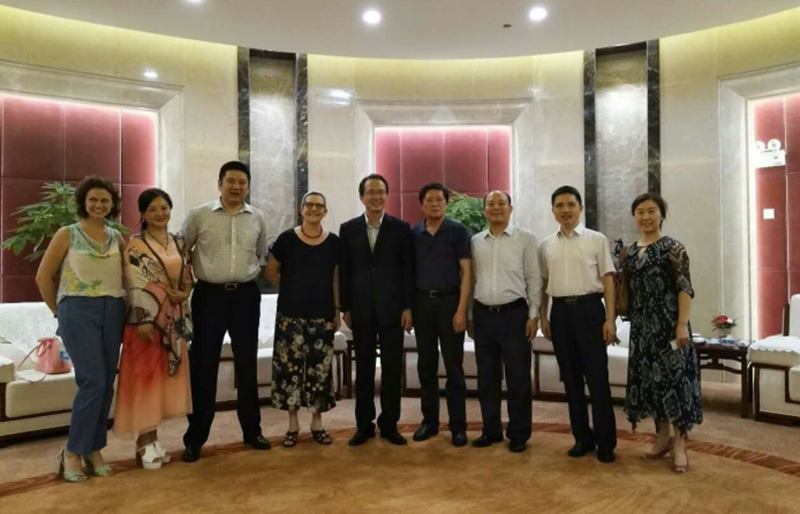 Consul General Hong Lei congratulated DSO on the complete success of its Changsha Concert. He highly appreciated DSO for providing the opportunity to Chinese music lovers to enjoy the beauty of symphony in such a hot summer. Consul General Hong Lei said that currently China-US relations faced a good development opportunity. The mutual understanding and friendship between the two peoples was the basis of the continuous development of bilateral relations. The tour of DSO in China was a successful journey of friendship and cooperation. He believed that this trip would further enhance the mutual understanding and trust between the two peoples. Hunan Province was rich in historical and cultural resources, and Changsha was one of China's historical and cultural cities. Consul General Hong also hoped that DSO would further strengthen the cooperation with Hunan province and Changsha City to continuously make positive contribution for the friendly relationship between China and the US. President and CEO Ms. Anne Parsons said on behalf of DSO that they highly valued the exchanges and cooperation with China, and felt it was a great honour to visit and perform in Changsha. DSO received a warm welcome and was impressed with the enthusiasm of music fans in China. DSO was devoted to enhancing bilateral cultural exchanges and further strengthening cooperation with Hunan province and Changsha City. The DSO's Asia Tour 2017 is its first international tour since October 2001. They held concerts in Suzhou, Wuhan, Changsha, Chongqing and Shanghai from July 22 to 29, 2017.